A few minutes later Decker was answering a question about his offensive coordinator, Adam Gase, being a head coach one day. He was giving exactly the boring response you’d expect (“He definitely has all the tools … Right now I know he’s focused on finishing this season strong.”), while ten feet in front of him, a woman with a giant foam finger is jumping up and down in front of a camera, asking Decker to marry her and “put a ring on it!” She means the foam finger. This sequence seems like a good snapshot of what media day’s all about, a festival of canned answers and corny gimmicks. For me, it all started on a bus at 7:30 a.m. to Newark, sitting next to an Israeli reporter and across from writers from Wisconsin and Erie, Pennsylvania. We got to the Prudential Center by 8:45 a.m. and quickly found out that there was no Wi-Fi — or if there was, we couldn’t find it. This made work more complicated yesterday, and it was a very New Jersey way to kick off the New Jersey portion of Super Bowl week. I started to complain about this for a second before immediately realizing it’s impossible to complain about Wi-Fi access without sounding like the most obnoxious person on earth. Whining about Wi-Fi access might be the whitest complaint possible. We should all do our best to avoid this. This has become as much a media day staple as all the athlete clichés. Every year, there’s a handful of people who dress up as the zany guys looking to shake things up and have a little fun and … I think I can pretty much guarantee that if you’re the type of person who loves these costumes, we could never be friends. I’m sure they’re all probably nice people … but still. This year, there was a guy from Denmark dressed as Waldo, somebody dressed up as George Washington, the Nickelodeon reporter above (“Pick Boy”), and probably some others I’m forgetting. This will never end — people wear the costumes to get attention, and it totally works — but that doesn’t mean we have to like it. It’s like the guy at a bar who tries so hard to look fun that he kinda just makes everyone sad. 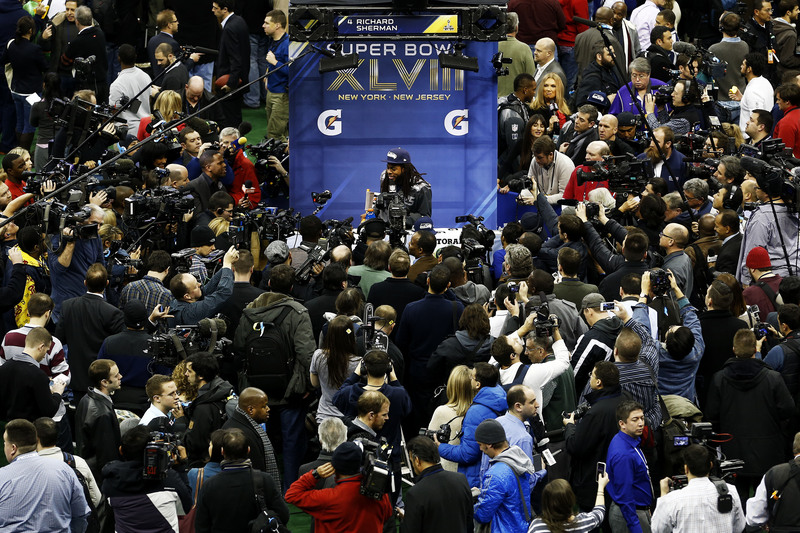 At media day or anywhere else, don’t be that guy. Every year at media day there’s someone with a beard who becomes a star of the proceedings. This year we had Max Unger from the Seahawks and the Steelers’ Brett Keisel, a giant beard superstar from a few years ago, who showed up this time to promote Head & Shoulders. Is this different from the costume people? Nope! Giant beards are every bit as consciously ridiculous; the only difference is that giant beards will never not be awesome to see in person. Or on TV. Or in pictures. Or anywhere. Country boys, hipsters, men, women, children, adults. Everyone loves beards. 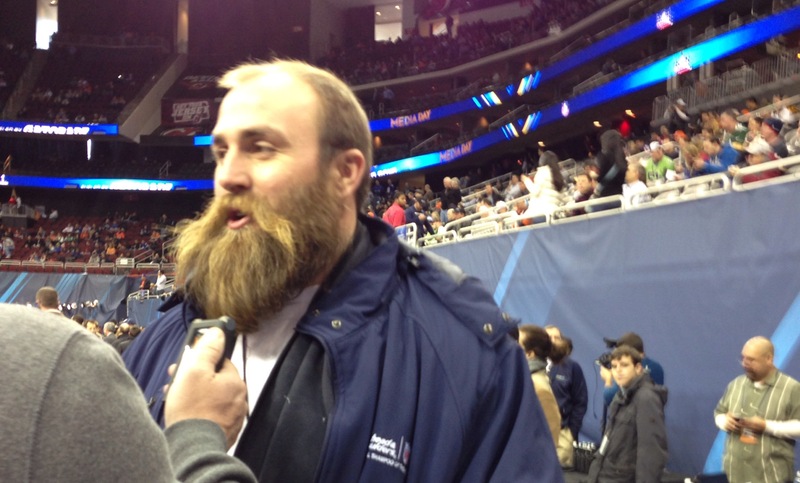 And that’s why Brett Keisel got paid to go to media day this year. I can’t grow a beard without it getting super disgusting after about seven days, but anyone who can grow one should definitely do it. You’ll brighten people’s lives on a daily basis. Every table in the media dining room — also known as the New Jersey Devils’ practice rink in the Prudential Center — had a centerpiece advertising famous products of New Jersey. There was Bon Jovi, Jack Nicholson, Albert Einstein, Joe Theismann, and all kinds of other luminaries of the Jerz. I was ready to make fun of this, but then there were also handwritten notes from local elementary schoolers welcoming us to Newark for the day, imploring us to have a great time, and saying how proud they were to be hosting the NFL. I instantly felt awful for laughing at this state that’s proud of Joe Theismann. Kids are so much more convincing than Chris Christie. Of course it was you, Golden Tate. Not really a lesson, but still. Good to know. If you’ve never seen the show Black Mirror, you should check it out. (Emily Yoshida has a primer over here.) It’s a show from England about the unintended consequences of technology, and how it eventually leads to all kinds of nightmarish scenarios for human beings, without us entirely realizing the nightmare as it happens. Every episode is a self-contained worst-case scenario that’s dramatic and entertaining, and by the end, disturbingly realistic. 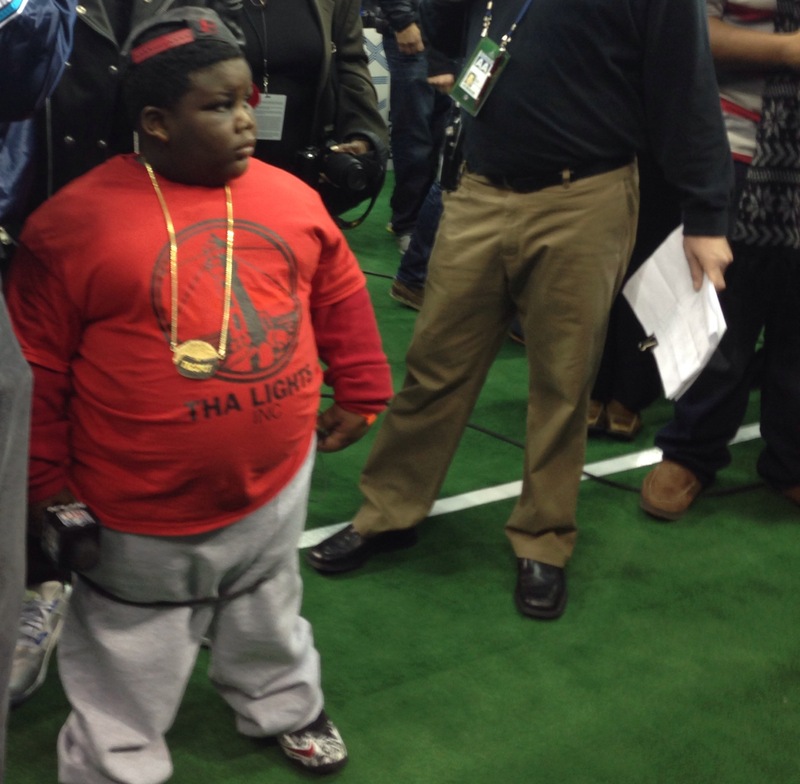 Anyway … Terio was at media day — because of course he was — and he might be the best example we have so far of a Black Mirror episode playing out in real life. A 6-year-old kid gets famous because of a six-second video that goes viral, and his family sees the opportunity to capitalize on his fame and starts dragging him around the country. Social media chronicles this entire journey and everyone quickly realizes it’s pretty messed up to drag this obsese little kid out of school on a promotional tour, but people keep tweeting about it so he stays famous and the whole cycle continues. Seahawks players — and Jets cheerleaders, and reporters, and everyone, basically — were legitimately thrilled to see him walking around media day Tuesday afternoon, but yeah. Save Terio. Free Terio. Stop Terio. And if you have no idea what we’re talking about in this section, you’re probably better off. Just know that we should all be terrified of how active he’s going to be at All-Star Weekend in New Orleans in two weeks. Look at the crowd around him. Richard Sherman commanded as big an audience as anyone Tuesday, maybe even bigger than Peyton Manning. His interview after the 49ers game was part of his career-long heel turn, and it’s never worked better than it did after the NFC title game. He’s now in the biggest game in America, on the same level as Peyton, one of the biggest celebrities sports has. Screaming into America’s living rooms was a great business decision, and that’s something people will definitely point out to you all week. Except there’s one caveat. This really only works if you’re Richard Sherman. There are legitimate criticisms you can make of the interview and his whole persona, but he’s handled everything since the initial interview better than anyone could have imagined, to the point where many of his critics now look stupider than ever. From pointing out the obvious coded racism in some of the reactions, to making nice with Erin Andrews, to media day, where he deftly sidestepped any trash talk that could’ve turned into an actual distraction before Sunday’s game. There’s a good chance he could’ve turned into a problem — or worse, a punch line — this week. He’s still the same guy who will talk trash and piss off people for the rest of his career; he’s just much harder to criticize, because he’s so impressive when he’s not trying to piss people off. Somehow he’s able to have it both ways, where he’s polarizing enough to be famous, but not actually hated by anyone who’s actually paying attention. … and then know exactly where the line is, and when to tone it down and remind people that it’s all a game. I wish more athletes were as entertaining as Sherman, but watching him the past 10 days, I’m pretty sure almost any other athlete would’ve screwed this up. Halfway through the Broncos media session I was milling around looking at all the podiums with guys like Decker, Trevathan, and Wesley Woodyard, noticing how few stars the Broncos really have. This is when I wandered over to Orlando Franklin’s podium — Franklin’s an offensive tackle — and heard him talking about his upbringing. This is how I found out about Orlando Franklin. He’s the starting offensive tackle who grew up in the Scarborough area of Toronto, and he was too poor to pay his own bus fare to get to youth football games, and he used to say “I can’t wait to go to jail for the first time” when he was younger. That happened twice before he was 16. Then came the pep talk from his older brother, and eventually Franklin turned the corner and started dedicating himself to football. 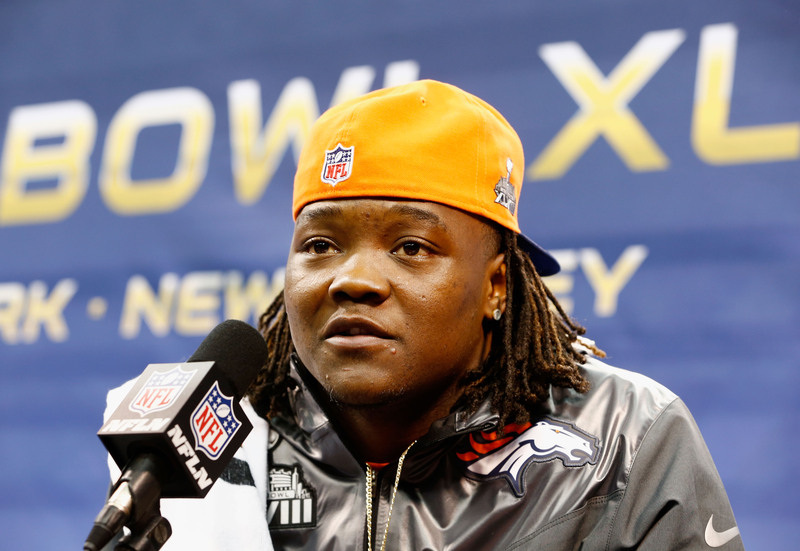 He went from Toronto to the University of Miami, and now he’s in the Super Bowl. Media day is stupid and overwhelming as a spectacle and that’s how the NFL can feel a lot of the time. Especially the Super Bowl. But the people at the center of this are actual humans, and humans with some of the most incredible stories you will find anywhere. If you can tune out the massive surrounding noise and listen to them, it can get pretty amazing. This is also true of people anywhere, and for like 30 seconds Tuesday we got a reminder of all that. Then the topic turned to Toronto mayor Rob Ford wearing Franklin’s jersey last week, and what he thought of that. Franklin, for the record, is just happy he’s a Broncos fan. Media day! Peyton is the best. He’s basically your dad, and he knows it. When they asked him about opponents listening to the Broncos’ signs, he bemoaned how advanced on-field microphones had gotten, and said the only way he could ever get them turned down is to start talking bad about Roger Goodell and the NFL. Peyton doesn’t seem like he’d be funny, and that’s what makes it so much better when he actually is. I can’t stand watching him play, and I’m pretty sure he has annoyed me as a player ever since Madden incorporated his OCD audibles into gameplay and I learned to hate those audibles forever, but as a regular dude, he’s sincere, and self-deprecating, and goddamnit you just can’t not love him. 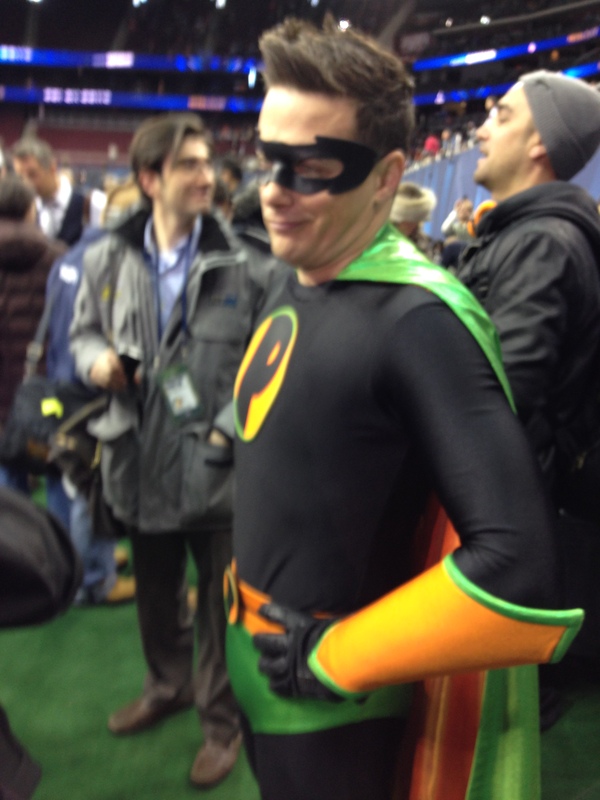 Favorite media day moment: reporter/older woman asked Manning for hug. He got out of chair, off dais, hugged, back to chair & questions. Media day is such a mess that if you spend the day there, you’ll almost definitely walk out without really remembering anything. Except Marshawn Lynch. We started the day with rumors that he’d skip everything entirely and earn a $100,000 fine. 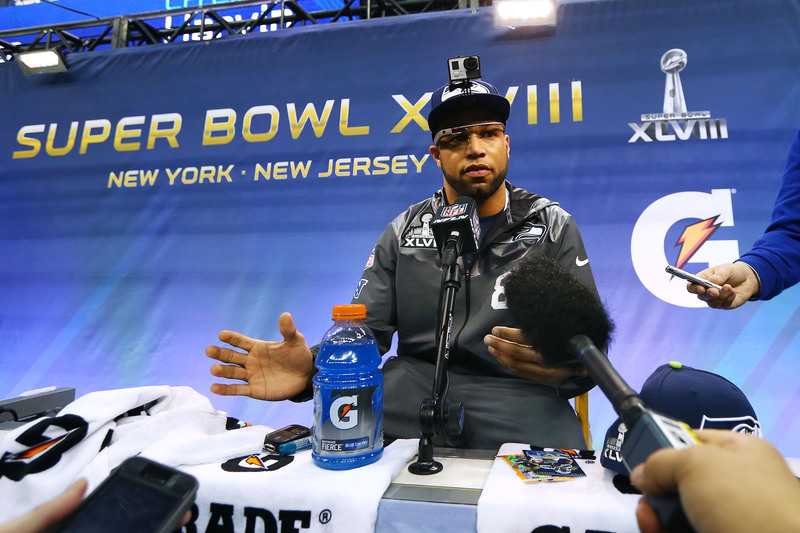 Instead, he showed up for exactly six minutes of the Seahawks’ media session. They stuck him on the far end of the stadium, because he didn’t want a podium, and I missed the six minutes entirely. It was legendary. It’s like he was speaking in yearbook quotes. “I’m just ’bout that action, boss” single-handedly got me fired up for Super Bowl. “I ain’t never seen no talking win me nothing” should be our answer to stupid questions everywhere. “Lay back, kick back, mind my business, stay in my own lane” is the American Dream and should be printed on money. And in the end, the only thing I’ll always remember from my first media day is the one guy who talked the least, and someone I never actually saw in person. For an event that makes no sense in 10 different ways, that’s pretty much perfect.